Newsletters are the new newspapers. They give publishers another way to push content to interested readers, and create an additional avenue for advertising revenue. Over the past two years, major publishers such as The New York Times, The Washington Post, Fortune, The Economist, and Buzzfeed have launched email newsletters, digesting news from their own sites, as well as stories from around the Web. This week Reddit joined the club. 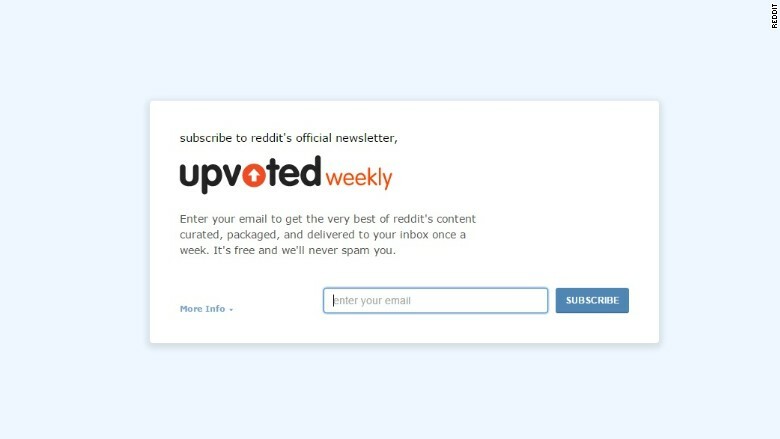 On Sunday, April 19, Reddit will send its first-ever newsletter, "Upvoted Weekly." The periodic email will contain stories curated by Reddit co-founder Alexis Ohanian and his staff from the trove of links submitted across 9,000 forums. While millions of people use Reddit every day, many don't understand its "concept," the site explains. The free, weekly Sunday newsletter is a way for them to understand the content across its network of communities. Readers do not need to have a Reddit account to sign up. Reddit also recently launched a podcast series, Upvoted, with a similar concept in mind. According to Ohanian's blog post, the digital radio show has already been downloaded more than 600,000 times since launching in January.